Do you have a kid who chews on everything and/or has to put everything in their mouth? My oldest son does. He is constantly seeking oral sensory input. Meanwhile, I tire of hearing myself repeat, "Stop chewing that." Since he has a high oral motor needs, we have to incorporate a variety of oral motor activities into our day. 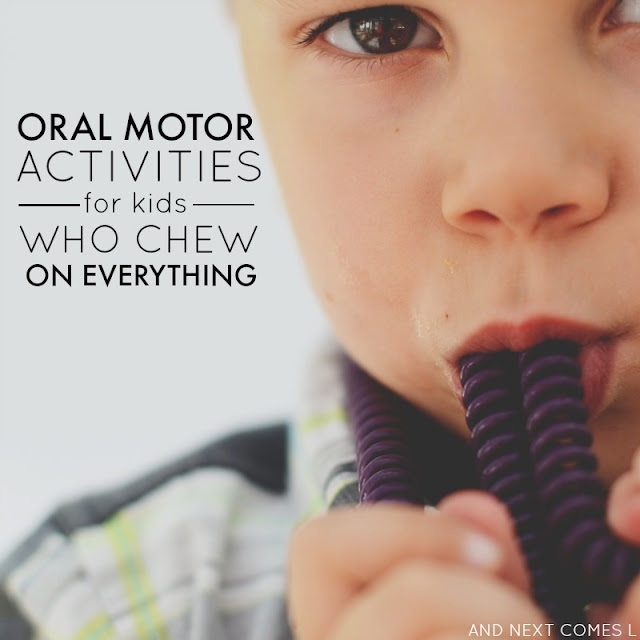 Here are 24 oral motor activities to try with kids who love to chew. I have also included a free printable list of these activities so that you can print them off and reference them throughout the day. And I've even included some great chewy toy suggestions for those kids who need constant oral sensory input, such as my son. The best way to give your oral sensory seeking kid the oral input they need is to provide a variety of textures and flavors at snack and meal times. Be sure to offer new foods on a regular basis. 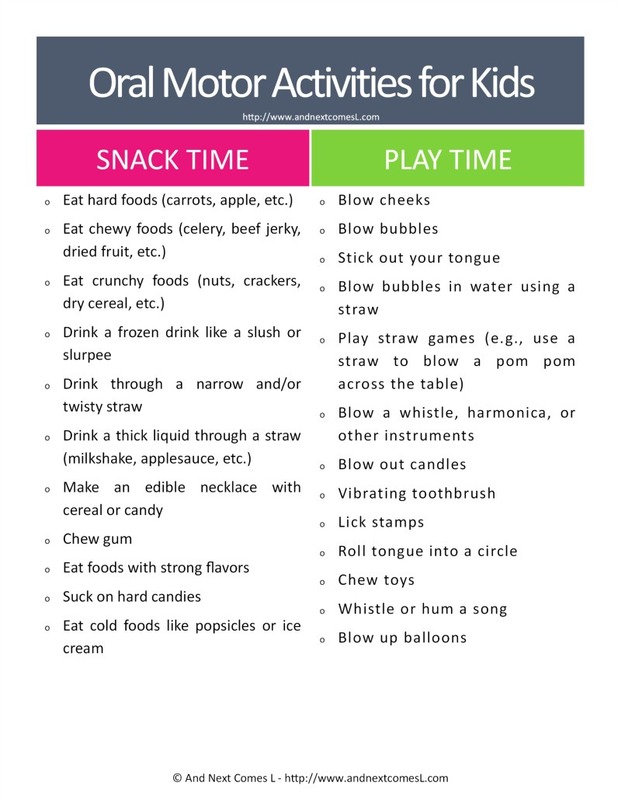 Here are some oral motor activities that can be done during snack time or meal time. There are lots of simple oral motor activities that you can do without specific toys. A lot of these suggestions work great for when you're in the car, waiting in line at the grocery store, in the classroom, etc. Spry Natural Chewing Gum - We choose to use natural chewing gum for our kids. This gum has a great flavor and works great! ARK Therapeutic Brick Stick Chew Necklace - I love that these come in Extra Extra Tough and can withstand more aggressive chewing. Abilitations Integrations Chewlery Chewable Jewelry - Set of 7 Necklaces - These necklaces make great fidgets too! Highly recommend these. However, these may get caught in hair if your child has long hair. Chewy Tubes P & Q - These are particularly great for hyperlexic kids simply because they are letters of the alphabet. Chewy Tubes Knobby Super Chew - Love the texture on these! Chewy Tubes - These offer lots of different textures to chew on. Chewigem Dog Tags Chewable Necklace - Another cute chewable necklace to try. If your kids love to chew on fabric, you could always let them chew on bandannas! 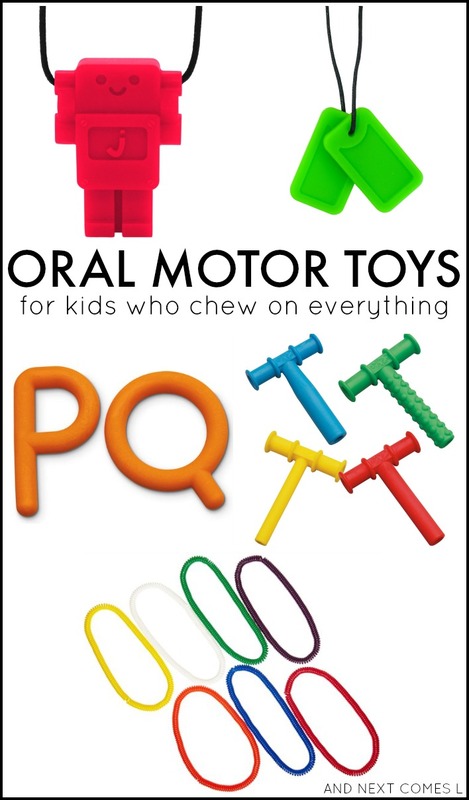 Or this list of oral motor sensory toys and tools for ideas. Or if you prefer the DIY route, try these DIY chewelry options. Or if you are needing something extra tough, then you will want to check out our top picks for the toughest and most durable chew necklaces for kids. Hello, How do I gain permission to access your free printables? You don't need to gain permission. Just click the link and it will open in Google Drive. Then just click the save, download, or print buttons. There are other printables on the blog that are set up to be emailed directly to you instead. I haven't switched this one over to that method yet.